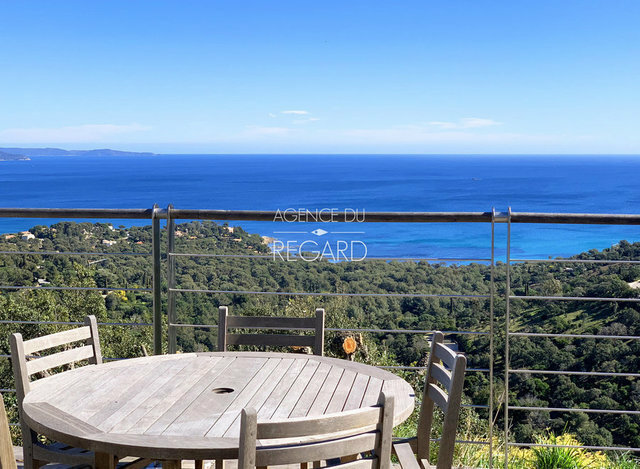 In Bormes-les-Mimosas, in the private domain of Gaou Bénat, this property of approximately 829sqm is located on the heights and enjoys a panoramic sea view and the Bay of Gaou, the Cap Negre and the Cap Lardier and isle of the Levant. Contemporary house of about 119.95sqm built in 2015 with high quality materials. The cladding of its stone facade of Bormes remains to pose. It shelters 2 bedrooms (possibility 3) with their bathroom, kitchen, stay, winter living room, buanderie and storeroom. It is extended by a beautiful terrace in raw teak which hosts a SPA. 2 places for garages (about 38sqm) adjoining the plot..